BELIZE CITY, Thurs. Aug. 31, 2017–A tropical wave in our area spawned unstable weather over parts of Belize last night, bringing with it winds of between 10 and 20 knots (11.5 – 23 mph) and heavy showers. Dark gray clouds covered Belize City skies this morning as thunder roared during the morning hours, signaling continued influence from the tropical wave which had already crossed over Belize. The rains today were mostly along Belize’s northern coastal waters. A small craft caution remains in effect. However, more unstable weather has been forecasted for this weekend. Forecaster Francisca Wellington told Amandala that another tropical wave is expected to bring more showers, especially on Saturday. She explained that tropical waves form off the coast of West Africa and move across the Atlantic. This coming tropical wave is expected to bring showers and isolated thunderstorms over much of Belize, with rainfall dwindling on Sunday and affecting mostly the southern part of the country. Although there is not much to be worried about in relation to the expected tropical wave, Wellington warned that Belizeans should keep an eye on Hurricane Irma, which is now a category 2 hurricane with 100 mph winds and is forecast to strengthen into a category 4 hurricane while making aim for the Caribbean islands. 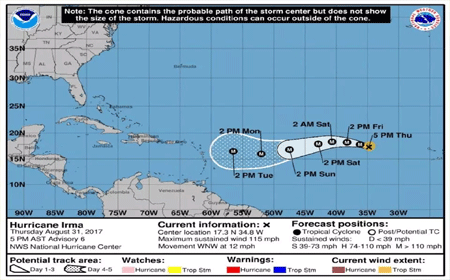 Currently, Belize is not within the hurricane’s projected or probable path, based on information from the National Hurricane Center in Miami and the Weather Channel.